I don't run a Beast team. I don't have the hard on for them the devs do, therefore Rhinox being the only "reliable" counter to him, that's wasted resources for me that could be spent on a bot for more than a singular purpose. They say Kickback should counter him, but I haven't seen it. KB just can't take a punch and the power drain doesn't keep up.Rhinoxpposed to have a 90% power lock rate, yet it only works about 1 in every 5-6 hits, and that's if the AI doesn't just Dodge it. 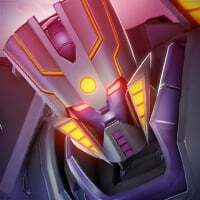 As much as I enjoy using Megatronus, I feel he shouldn't be a playable character. Looks like now this month Oprah is giving everyone a Megatronus. Raids feel like a grind as it is. He only makes it worse. 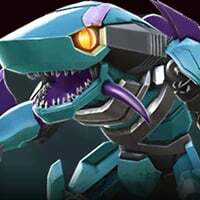 Kickback can temporarily turn off robot resource if you connect with a heavy, I think until the opponent uses a special then you have to turn it off again. Once you power lock with Rhinox, the chance for it to happen again decreases by 70% for 16 seconds. Then it goes back to 90%. Yeah sometimes the AI dodges it, it is what it is. I recently switched to Soundwave following the suggestion of a friend. Oh he baits too well Tronus' specials. Fought bases with 2 Tronuses and hardly had worries about his sp3. Soundwave's heavy has low recoil distance and he stays close to Tronus, triggering the latter's wake-up specials. And I don't gamble with my Sp1 to power leak, I just stick with sp2. The problem with Soundwave is that you have to take account for nano-bleed-jack, that's why I brought my duped Grimlock. But he always needs a long fight compared to a purifying Cheetor. I didn't realize Rhinoxs PL decreased after the first shot. Maybe that's the issue. Maybe I just need to work with KB more. 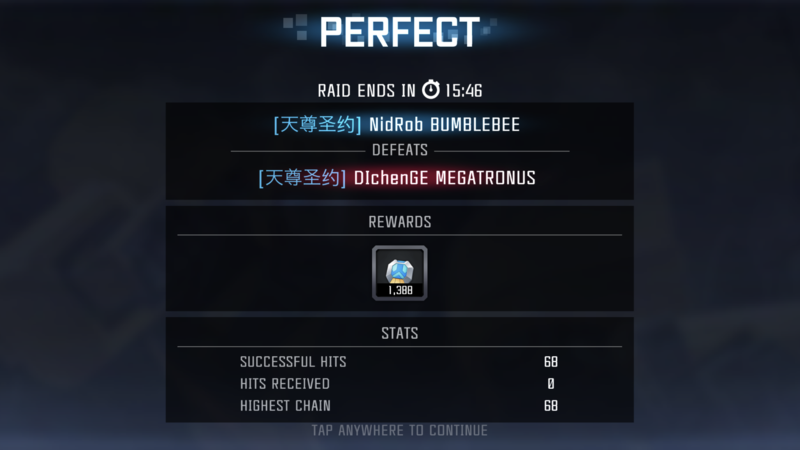 I ALWAYS bring Grimlock on Raids for Wheeljack on HA. Burns right through the shields. So I tried Kickback. He shut it off. I think maybe I need to be on the lookout for a 5* bug in the near future. After he's nice and beefed up maybe he's the answer to my problems. I actually wish I liked the Beast teams better. I have a 5* Rhinox I just don't enjoy using. He sits on base defense mining for gold. 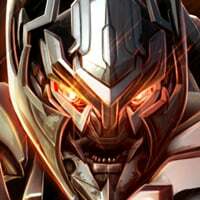 Have you tried Prowl on Megatronus? Shockwave is the way to go. Stack up shocks and keep on firing. Prowl can hardly do the trick. His power gain has some cooldown time. Along with the charging time, you need to seamlessly land your sp1s to keep Tonus' power at a safe level. One mistake and you're in need of baiting, which seldom go well. Even a high signature Prowl? Chances are you are going to almost always have to dodge at least one special against a Robotrounus anyways. Prowl was my go to guy until Megatronus. His power drain can't keep up with the RR, even with the power rate debuff applied when drained to 0.
of course his is ruining . if a xp boost or any other boost cannot be stacked how come a mod stacked with the basic abilty. 1.2% power gain of tronus+3.1% power gain off RR = death for those who don't pay the game . i think that buy placing RR the opponent should not gain power other than that,not even by hits. Quit complaing, at first raids were too easy now they are too hard? Rhinox is the trick. Without Trouns on base it would be the same vinilla boring stuff. At lest he makes it somewhat challenging. There are a bunch of power control bots that can all deal with Robotronus. Some can't, such as WB or Mirage so they aren't on this list. Funny you say that because I exclusively use Mirage because WJ is in AM and there are multiple methods that make it doable. However it is still buggy because he seems to randomly bypass his shield sometimes on what should be the ranged hits. I've noticed that sometimes during Meg s3 Mirage's shield will go down immediately, and get killed, and sometimes it will last until the end of the s3 (as it should), limiting damage. Also this is not while Meg sig is active on Mirage so that is not the issue. However if you want to use Mirage it helps to have a higher sig for s1 to drain but you can also use s2 and stun lock. If Meg's defensive buff is up he sometimes stops the debuff stacks and I've literally stun locked him for the entire fight when his power bar was full because until you hit 15 debuffs Mirage will continue to stun every 7 hits. If you force him to have his offensive buff on s3 you can save for Mirage's s3 and get the last hit to bypass the invulnerability. Or you can try to stun lock him right when he gets to 10% health. IMHO the fight is still stupid because it still comes down too often to luck and not skill but I think Mirage is one of the better options because he can usually survive an s3. I also don't have Rhinox but I don't feel most of that list is viable when fighting both Megs especially when one is a max 5*. I'd say Rhinox = WJ (if you don't get unlucky with Meg sig) > Mirage > then all the rest. The problem with Mtronus on RR for me is more the monotony than the challenge. I can beat him relatively easily by using my own Mtronus and Jetfire and I don't bother putting him on my base. There really are no perfect answers to him and I do hate the luck factor of it. Bottom line... Just because you lose a couple raids now and then, doesn't mean something needs to be nerfed. Like I said I’m bored today. I still slightly disagree because I continue to go back to skill. As skilled as you can be there are instances that the possibility to win is slim in this fight. I have simply quit out of the fight when his sig triggers multiple times and he turtles until s3. It’s lame. 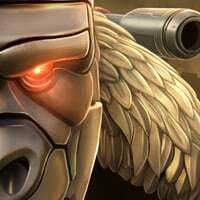 I also knew it would only get worse as 5* Megs are ranked. Clearly no balance updates are ever coming so it’s all moot. Shockwave is not a great bot for him but the balance between skill and luck is too far skewed on this one. Shockwave was my go to, but the RnG of his sig can really screw you over. If he'a unduped then Shockwave can control him relatively easily. @Manthro Jazz never crossed my mind. Good thinking. As for Prowl, he can't keep up with the power gain. Mirage is pretty good if you can actually land a hit on him to drain the power but AI determines if you land a hit or not....it becomes a 100% range battle at that point, and that's only of you don't get hit. Shockwave I could see as an option. I have a 5/50 4* at sig 98. It's just a race to see who gets the first power bar....and it's always Megatronus. As for Wheeljack...will the dark burn go through the force shield? I haven't ranked my WJ yet but he's on my short list. I agree with @kranders.....it's monotonous at this point. Every.....single....base....has a Robotronus on it. It's just another grind. That being said, sometimes the grind is worth it. I landed a 5* Dinobot with my T4KC yesterday. Mirage can drain against blocks. With a high sig use s1 and shoot away until the buff expires. Dark burn can bypass his shield but it’s bugged. About 90% it does not bypass his shield and then randomly will go through. I’ve found no trigger that causes it so it’s like a bug on a bug. WJ seems to work like this: If his shield is active before the dark burn, you wear the full dark burn (it bypasses the shield.) If the dark burn damage activates the shield, then you take no damage through the shield. These days, I pray for the shield to wear off before the special 3 ends, so my Nanojack can activate it again when the dark burn hits. Tronus is so, so, boring. I used my 4,000 P.I. version to all but take down this month's Megatron in the Master spotlight. Just block, dodge the heavies, build power with no risk, then unleash special 3's. Throw in a few ranged heavies for a bonus dark burn. Healing on the special 3 just made it more broken than it already was. Where is the fun in building a roster, when there's one bot to rule them all? I still don't understand why so many other bots were nerfed, yet Tronus goes untouched. Or power steal depending on what relic is activated. I mean... I know he is OP, but this is exactly why I refuse to use him. He's cheese, and broken overall when you consider what he can do without lifting a finger. Tell me about it. I tried him out on Master just out of curiosity. It really was far too easy to kill things considering his P.I. Just holding block until SP3 is a really boring fight sequence, but ridiculously effective. I hate robotronus too. I depend highly on auto fights for raids. Usually my R4 5* BW team can take a bot, maybe losing half life or less per bot for bots that are equal or less pi. But for Megatronus, a 4k Megatronus can KO my bots. That’s how broken the AI is, compared to the AI of other bots.